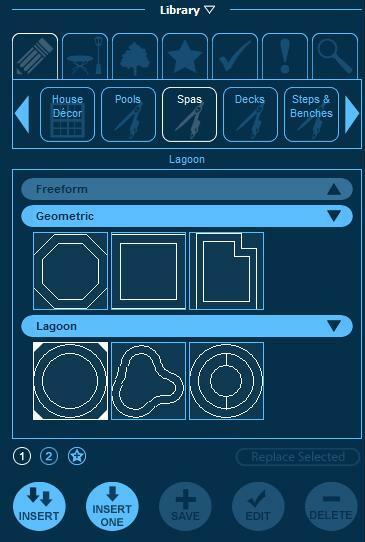 This stage allows you to create spas by using the drawing tools to draw a new shape or by inserting a template from the library. The Spa Stage allows for the creation of multiple spas including fountains, spill basins, ponds, and other shapes. Height: This control sets the height of the selected spa. Hide Outer Line: By default the coping edge of the spa is shown as an outer line in 2D. This option will hide the outer line in the 2D view and in construction. Hide the Height Label: By default, the height of the spa is displayed. This option will hide the label in the 2D view and in Construction. Spa Depth: You may set the depth for the selected spa with this control. 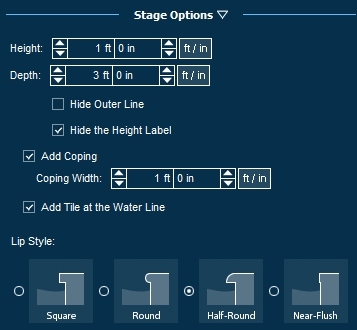 Add Coping: This checkbox allows you to add a coping edge to a selected spa. Add Tile at the Water Line: This checkbox allows you to add a a tile line to the spa. The Library contains templates of previously drawn spas. The templates are organized by Type under the Spas Category. Select the template you wish to insert and either click the Insert button or double left click on the image of the template. When you move your cursor to the viewport, the template will follow until you left-click to place the item. You can also save templates you have drawn for future use with the Save button.